Snow was falling hard and fast. Wind gusts were blowing icy wetness into my face. 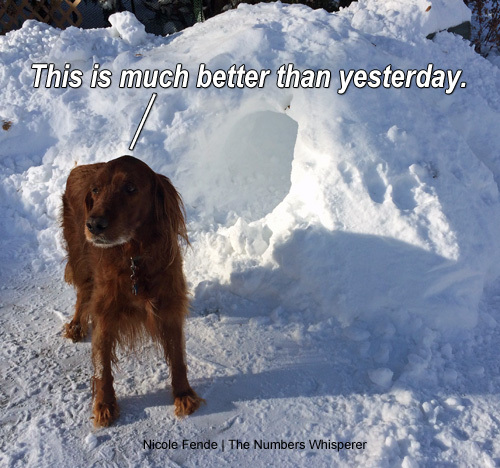 Even my love-the-great-outdoors Irish Setter wanted to go back inside. Why was I shoveling in the middle of blizzard? Here in Minnesota we had a major snowstorm yesterday. School was cancelled. The road in front of our house still hadn’t been plowed by 10 p.m. About 10 inches of snow fell in 24 hours. All predictions said it would snow until at least midnight last night, and they were right. Knowing all this, I made the clear choice to shovel our driveway and sidewalk around lunchtime. You read that correctly. I shoveled snow in the middle of a blizzard. Certain types of snowfall can be wet and heavy. Today’s snow was very heavy. Shoveling four to five inches of snow is hard work. Shoveling eight to ten inches of snow is back-breaking. I’ve learned through years of northern living that it’s better to clear the snow mid-storm then wait until it ends. It actually takes less time, and puts less stress on my back, to do it twice. As I was out shoveling the second time, around 5 pm in the evening, I realized my method of shoveling was a perfect analogy for many tedious tasks in small business. We put them off, letting them accumulate, thinking we can get it later in one go. The tasks snowball (pun intended), making the work exponentially more difficult. We keep putting them off, long after we should. Unlike the snow in my driveway, many necessary tasks can be ignored in business until they’ve created a very major problem. We miss out on opportunities, such as end of year tax savings, or realizing we’re still paying for an online software app we haven’t used in six months. You may be wondering, why don’t I just buy a snowblower? Or hire someone else to plow my driveway? The business equivalent of buying a app, software, tool, or hiring someone to do it for me. Great question. I have thought about it, but every year I decide to keep shoveling for the following reasons. There are more effective ways to spend money on my house and its upkeep. I enjoy shoveling. Usually it’s a light workout, getting me outside and allowing me to meditate. It’s how this blog post was born. 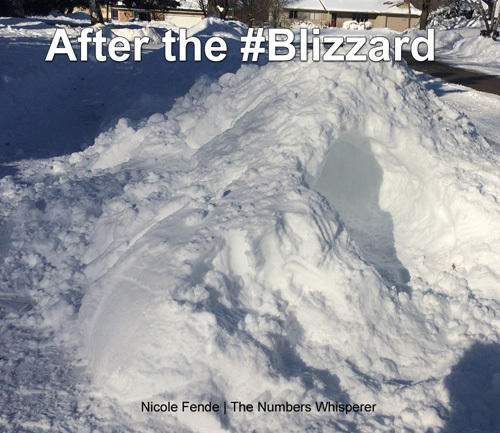 Despite the storm, the school cancellation, and my unusual shoveling choices, I still managed to finalize preparations for this Wednesday’s webinar. The 3 Massive Mistakes Healers and Coaches Make That Keep Their Calendar Full and Bank Account Empty. If you haven’t signed up yet, grab your spot. If you have a friend or colleague suffering from a busy schedule but flat profit share the link. There’s no cost. Simply great information to help Healers and Coaches start 2018 with a strong foundation.